We discovered this afternoon that Off Campus access to PubMed and to all EBSCOhost databases is returning a 502 error. Our IT support is working to resolve the issue, but we will probably be without off-campus access for the weekend. 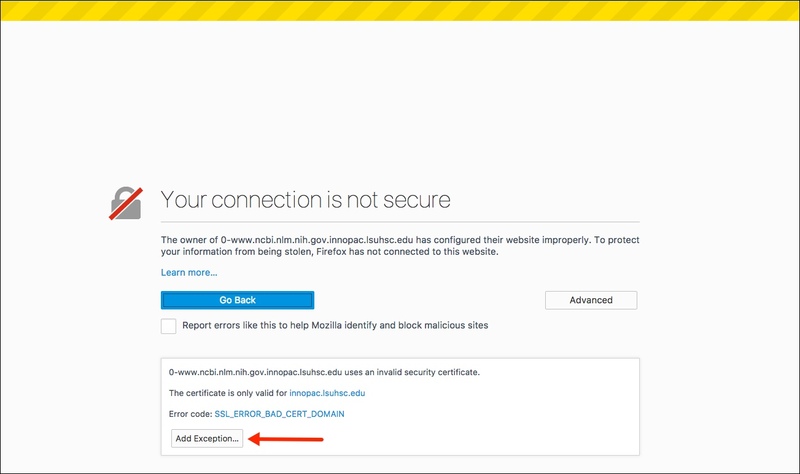 The same error appears when trying to access the databases through CITRIX. Titles of individual journals through the catalog appear to be working. Please contact the Circulation Desk at either Library for additional help. 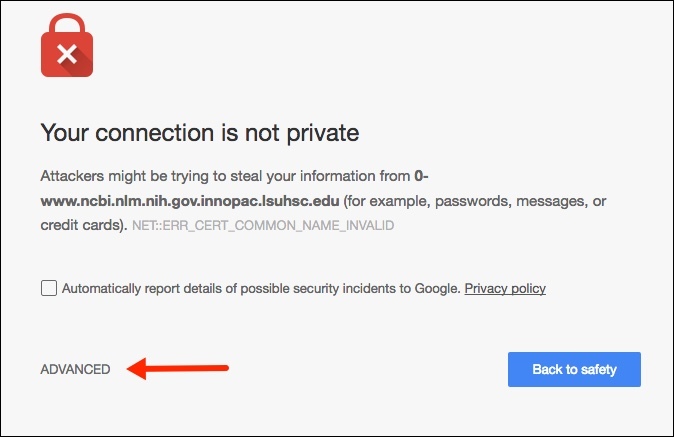 Today PubMed along with all NCBI sites permanently changed their web addresses to use the HTTPS protocol. 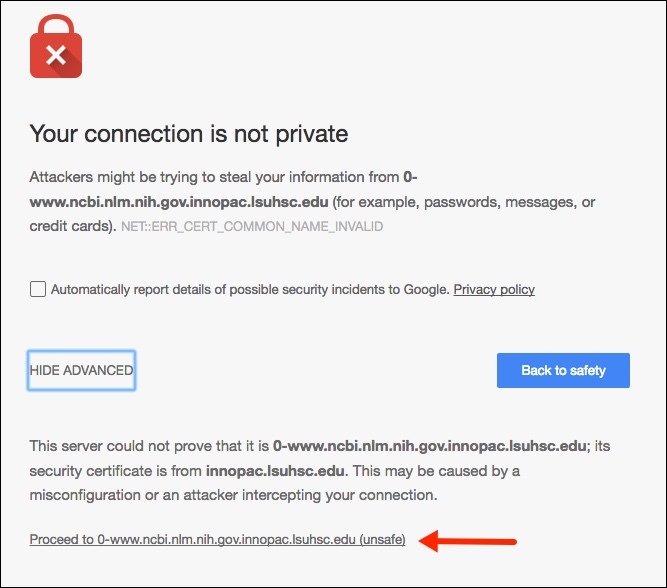 Unfortunately, this is now prompting a security warning when using the Library’s off-campus link to PubMed. 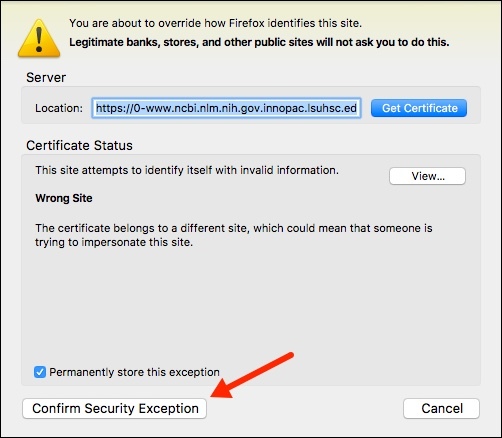 Although in this case there is no real danger in proceeding, you will need to add a security exception to your browser in order to get to PubMed. If you need any help with this or other Library resources, do not hesitate to contact us. PubMed Commons?áis an exciting new pilot project from the National Library of Medicine that allows researchers to comment on any scientific publication indexed in PubMed and to read the comments of others. Currently, PubMed Commons is in a pilot testing phase and only invited participants can add and view comments in PubMed. However, anyone in the pilot phase can invite a fellow author indexed in PubMed. All they need is your PubMed ID (PMID) and e-mail address. For more information on how to join PubMed Commons click here and stay tuned for the next phase of this project! Tags: PubMed | E-Resource News, PubMed | Permalink | Comments Off on PubMed Commons | Posted Monday, December 2, 2013 by Brooks, Jessica P.
PubMed Commons, a new forum community created for online collaboration for ÔÇ£constructive criticism and discussion of scientific issues,ÔÇØ has introduced a pilot version. During its closed pilot phase, PubMed Commons will be allowing accounts using approved email addresses from PubMed authors to participate. ?áNIH or Wellcome Trust grant recipients can also join and invite others to join. You can test whether you have access here http://www.ncbi.nlm.nih.gov/pubmedcommons/join/. Users will also need a My NCBI account. Find answers to frequently asked questions on this page: http://www.ncbi.nlm.nih.gov/pubmedcommons/faq/. Tags: Databases, PubMed | E-Resource News, PubMed, Tools | Permalink | Comments Off on Testing, Testing: PubMed Commons Community Forum | Posted Thursday, October 24, 2013 by Phillips, Holland T.
Where you go to set PubMed?álimits such as dates, language and article types has changed – hopefully for the better. It’s all just semantics with a little bit of functional design thrown in, really. Confused? Enraged? Apathetic? We welcome your responses and questions – just give us a call, email or chat and we’ll do our best to help. Problem: you want to search PubMed for a phrase like text messaging, but the phrase keeps getting broken up. ÔÇó Search the phrase first without quotes or search tags. ÔÇó Check Search details to see how the search was translated. ÔÇó Use quotes (” “) when your phrase is broken apart. Using quotes work really well when you are looking for a specific article title! Harry Truman was President, gas cost 15 cents a gallon, the transistor was invented, and internationally renowned surgeon Dr. Michael DeBakey was publishing articles on the US Army’s World War II experience with battle injuries, military surgery, and the use of streptomycin therapy. Citations to these and more than 60,000 other articles indexed in the 1947 Current List of Medical Literature (CLML) are now available in the National Library of Medicine?« (NLM?«) MEDLINE?«/PubMed database. That brings the number of citations available in PubMed to a whopping 20 million! That is a lot of biomedical research for only 63 years. PubMed will be operational but may be intermittently slow starting today Friday, November 13 at 2:00 PM until Saturday, November 14 at 7:00 PM. Sorry for the inconvenience.